To most Japanese people staying at a ryokan is the destination itself. 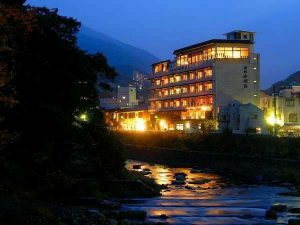 People spend time relaxing in the hot spring, eating the evening meals, or just relaxing with friends and family. There are some types who want to get out to see and experience more. The Yumoto area around Hotel Okada has some wonderful spots and activities to enrich your time in Japan. Hakone is famous for the many different hot springs in the area. 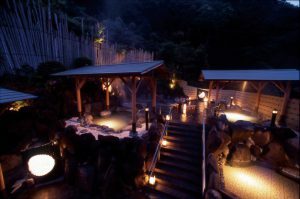 An unforgettable experience is sitting under the stars in the cool evening air enjoying the Japanese onsen. Take the time after your meal to dip into the relaxing waters of one of Hotel Okada`s outdoor hot springs surrounded by nature and with the open air above. Hotel Okada has a number of outdoor bathing options to enjoy in the evening. Guests also have access to the Yu no Sato Hot Spring facilities until 11:00 pm. These hot springs are a short walk from the main hotel and built on the side of a hill surrounded by the lush nature of Hakone. Enjoy one of the many different types of baths at your leisure under the stars. Head down the Hakone Yumoto Station area to find some evening options for good food, some drinks, and to mingle with the locals. Many of the stores around the station cater to the tourists during the day selling snacks and souvenirs, but in the evening there are some great establishments to visit for a nice drink or food. 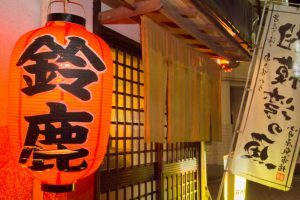 If you need a break from Japanese food, this restaurant is an absolute must visit! This restaurant have the delicious pizza, Wagyu steak and gelato. 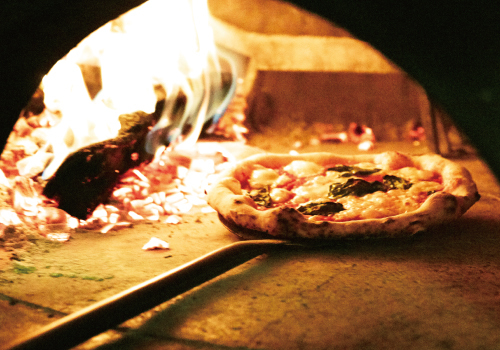 They have created a perfect way to blend Japanese tastes into Italian classics. The late night establishment features delicious fried chicken and highball drinks. 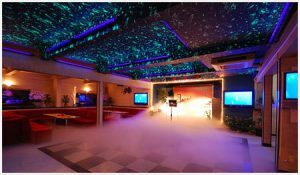 The restaurant is popular with those getting off late night shifts and has a fun and energetic ambiance reflecting the young patrons visiting for a late night cap to a long day. Visit for some great local food and to get a taste of the local back alley dining fun. 10 minutes by taxi from Hotel Okada, the taxi fee about 1200 YEN. A late night experience for local food, fresh fish, grilled meats, and a taste of the seasonal ingredients from around the area. This is a place is open until 11:00 pm and serves visitors and locals who are looking a place to unwind after work or a long day taking in the sites. The menu reflects the in season produce and there is an extensive drink menu that will give you chance to get a taste of the local vibes. Located just steps away from Hakone Yumoto Station on the back alley to the right following the road along the base of the train tracks. Kinosuke is open until 10:00 with last orders of their home grilled chicken and fish at 9:30 pm. 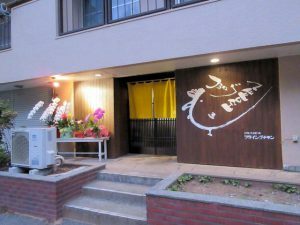 This new addition to the night life in Hakone serving quality food in a relaxed Japanese environment. 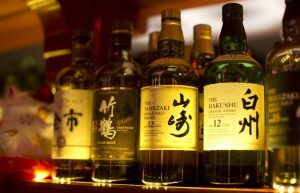 The restaurant is located up the street from Hakone Yumoto station and serves local sake and cold beer to compliment the extensive menu. The dark lighting and wooden interiors give this place a warm whiskey bar atmosphere. There is a counter and some seats, but the main draw of this establishment is the wonderful well-dressed couple serving drinks. They seem to have been running this place for decades with the stories to tell and always meet new patrons with a welcoming smile smooth drinks. The pub is in a red brick building hidden behind the Hatsuhama Shinkan Soba store down the river from Hotel Okada. 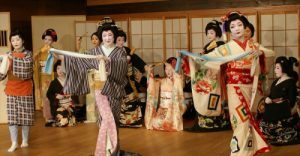 Geisha were once found practicing their arts throughout Japan, but their numbers have declined and now there are few places like Hakone and Kyoto where you can enjoy the company of a geisha. Geisha in Hakone are an exciting opportunity to see, feel, and interact with a special part of Japanese culture and history. 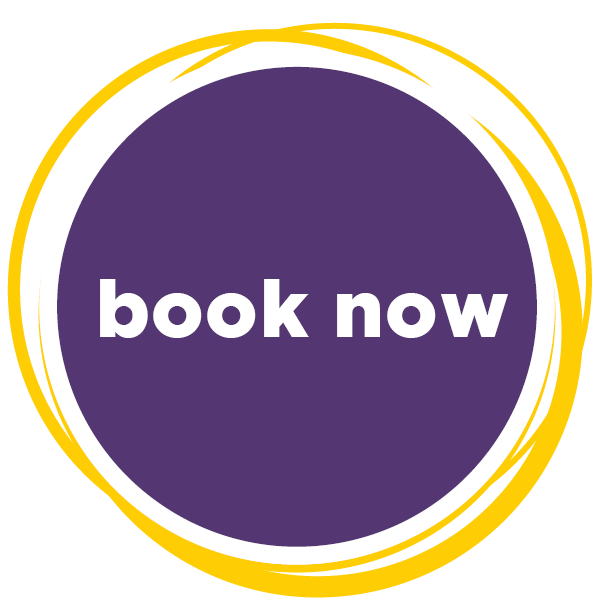 Contact the front desk to set up an evening, be aware that the price for the experience matches the special occasion. 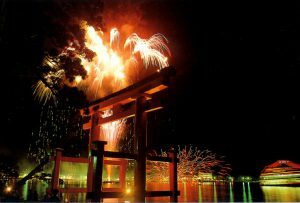 The following website which you can check the event around Hakone. Summer is a time for fireworks, spring and fall for lit up blossoms or leaves, and winter for illumination.